#TestDriveParenthood Event + Enter to Win a Britax Endeavours Car Seat! This post and giveaway are in partnership with Britax and SheBuysCars. According to the National Highway Traffic Safety Administration, every 33 seconds, one child under the age of 13 is involved in a crash. With that said, road injuries are the leading cause of unintentional deaths to children in the United States. When I had my first child over 18 years ago, I had no idea how to set up a car seat, which one to purchase, nor did I know who to ask. The hospital simply required me to have one for my daughter, but beyond that, I was on my own. Over the years more resources have become available for parents to help them properly set up their car seat. September 17th-23rd is Child Passenger Safety Week and Britax on a mission to create safe car seats while providing you with the knowledge you need to keep your little ones safe. Britax is a 70-year old company and a pioneer in innovation. Their latest invention is the new Britax Endeavour Infant Car Seat. 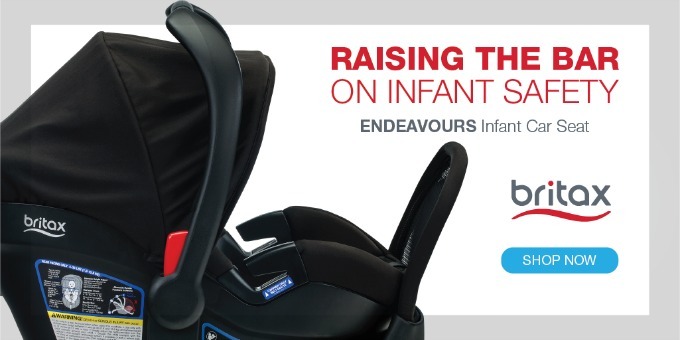 The Endeavours infant car seat is designed for safety and mobility. The anti-rebound bar reduces rebound rotation by up to 30% in the event of a crash! You can easily and securely install the car seat with a base or without. As an industry leader in safety and quality, Britax works with customers and outside experts to inform its thinking and innovation. Which is why they’re hosting the #TestDriveParenthood Events at various locations throughout the country, so that you’re better informed. Tuesday, September 19 @ 11 A.M.–2 P.M.
Wednesday, September 20 @ 11 A.M.–2 P.M.
Thursday, September 21 @ 11 A.M.–2 P.M.
Want the chance to win a Britax Endeavour Infant Car Seat? Enter the giveaway below and good luck! This giveaway is open to US residents only 18 and older. Giveaway ends on September 30, 2017, at 11:59 pm ET. The winner will be notified via email and must respond within 24 hours to claim the prize. But wait, there’s more! You can also enter this second giveaway hosted by SheBuysCars for a chance to win one of seven (7) Britax Endeavours! Must be 18 or older to enter, US addresses only. No purchase is necessary to win. Void where prohibited. Must fill out Rafflecopter form. My favorite feature is the Easy Remove cover. Thanks for the chance! I love how it has the anti rebound bar . Such a great feature. I really like the anti-rebound bar feature! I like the Anti-Rebound Technology. My favorite feature is the anti-rebound bar. I love how easy it is to install the car seat without the base. We travel a lot and the less we have to take the better! Safety is priority for me, so I love all the safety features! My favorite feature is the 2 layers of side impact protection. The anti-rebound bar is a really neat safety feature! I like that you can also secure the car seat without a base. Love that there is a quick adjust harness! My favorite feature is the anti-rebound bar! I like that it’s made in the USA. The feature I really like is the two layers of side impact protection which is a must these days. I like how user friendly it is and all the safety features! I like that the car seat is easy to install. I really like that you can use it with the base or without if you so choose. I like that the Click & Go system allows you to pair the car seat with any Britax single stroller. I like that you can easily remove things to clean them. Quick adjust harness which makes it easier! I like that the easy-release harness button!! I like that there are so many good safety features, but my favorite is the anti-rebound bar. I like that it has a quick adjust harness. I love that it is designed for safety as well as mobility! I am loving that new Anti-rebound bar! The anti-rebound bar for sure! I like the easy-remove cover! I like that it is simple to remove all the parts to clean it! Love the extra long shade cover. I love that I can quickly switch the car seat over to my husband’s bar with or without the base. A great feature of this car seat is the anti-rebound bar reduces rebound rotation by up to 30% in the event of a crash! Most or 90% of Britax car seats are made in the company’s Fort Mill, South Carolina headquarters.